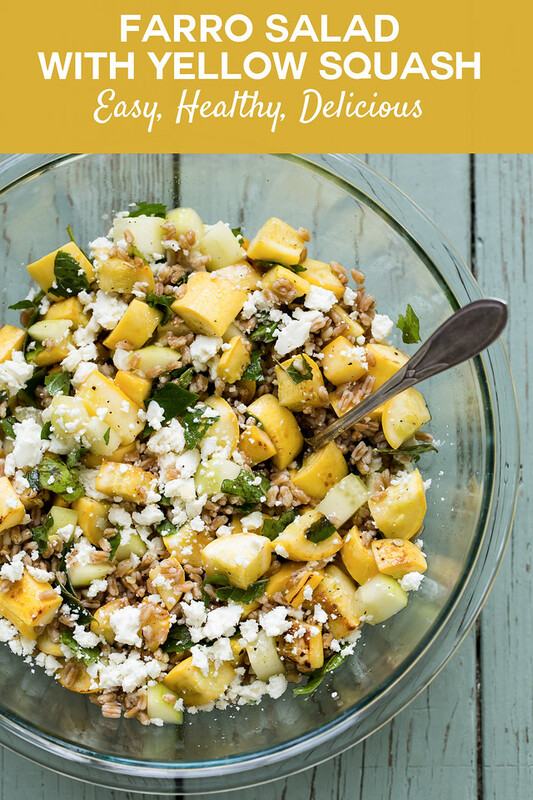 You will want to make this easy and healthy Yellow Squash and Farro Salad all summer long!! Perfect for using up all your garden produce! This post may contain affiliate links, full disclosure on sidebar. I have fallen completely in love with grain salads, as you can tell with How to Make a Grain Salad, Mexican Quinoa Salad, and Kale and Spelt Salad to just name a few! Besides being healthy, they are a great way to use up seasonal produce. We don’t have a garden, but I can see all the zucchini and yellow squash hanging off of my neighbor’s vines. Perhaps, I should share this farro salad with them, because it is wonderful. If you haven’t tried farro, it’s a wonderful mild grain. You could easily substitute your favorite grain or seed like bulgur, barley, or a super grain mix. You can also use zucchini in place of the yellow squash and goat cheese (or your favorite cheese) in place of the feta. So many easy possibilities with this grain salad! You will want to make this all summer long! I made this early in the day and kept it in the fridge until dinner, then I just brought it out about 30 minutes before eating so it could come to room temperature. The combination of the sautéed squash and the cool cucumber is perfect. The mint and basil add plenty of herby flavor and the feta adds just the right amount of soft tang. I reduced the amount of olive oil from 1/2 cup to 1/4 cup – because I like my dressing ratio to be 50/50. I found this recipe in Cooking from the Farmers’ Market by William Sonoma. This Yellow Squash and Farro Salad is a great way to use up some summer squash! In addition you get some healthy whole grains for a bonus! Bring to a boil a pot of salted water. Add the farro, reduce the heat to a low boil and cook for 12-15 minutes, or until tender. Drain and let cool. Meanwhile, heat two tablespoons of oil in a saute pan over medium high heat. Add the squash and cook until tender 2-3 minutes (I did it a little longer to get some nice browning). Let cool. Mash the garlic into a paste with a little bit of salt. Add it to a small mason jar and top with the 1/4 cup of lemon juice. Let it sit for 10 minutes. Then add the remaining 1/4 cup of olive oil and shake to emulsify. 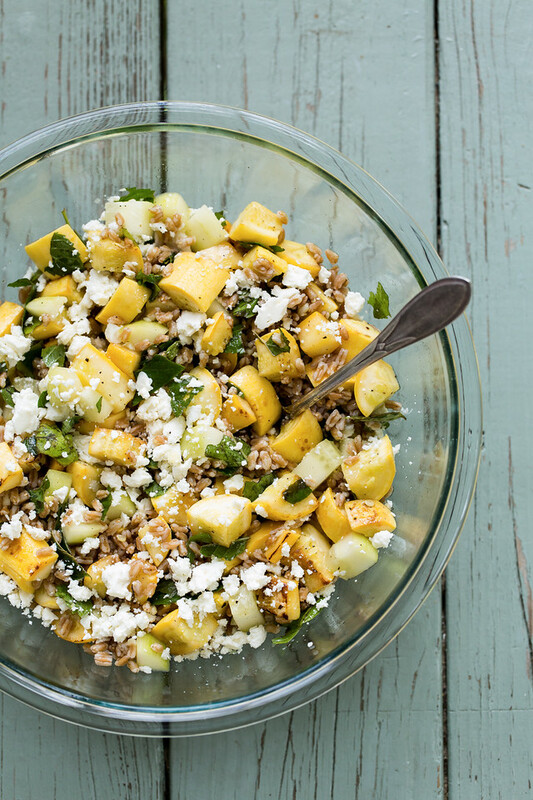 Place the farro, squash, cucumber, green onions, basil, mint and feta in a bowl. Top with the dressing and toss to combine. Season with salt and pepper. Some other farro dishes you might like: Chicken and Sweet Potato Farro Salad, Lemon-Cumin Grilled Chicken Farro Salad, Roasted Asparagus and Prosciutto Farro Bowl. Just ordered everything for the salad and my grocer doesn’t have farro, so I thought I’d check online. I find both pearled and whole and don’t know which to buy. Do you know what you used? Just sounds wonderful! That combination sounds wonderful! (I can’t eat farro, so will sub – maybe whole sorghum? – for it.) Perfect for a lunch box on a hot day… something that won’t wilt, let alone go off. Farro has been on my list of stuff to try for awhile. I love the combination with the yellow squash, sounds yummy. Wow, what a beautiful summer salad! Looks delicious. This would make a great summer recipe to take on a picnic. No salads for us – we are so into winter comfort food right now. This looks great! Believe it or not I have never tried farro. I think I need to pick some up and make this, minus the cheese but I am sure it will still be great. This would make such a lovely summer side… think I’ll add it to my go-to recipe box! Also I rarely see yellow squash around here! Man, the recipe really made me curious. I am a huge fan of farro! And I have summer squash, mint and basil and cucumbers all growing in my garden. This looks great…can’t wait to try! I really like farro based salads and love the addition of the squash to this one! I love farro. Have to try this recipe soon. Thanks for sharing this. I am SO into farro right now. I’ve had it in restaurants but just made a big batch at home for the first time. It keeps in the fridge so great, making it perfect to have on hand for salads just like this one. Love love love. This looks like such a tasty way to liven up summer squash. This recipe would be great at a picnic or for lunch!